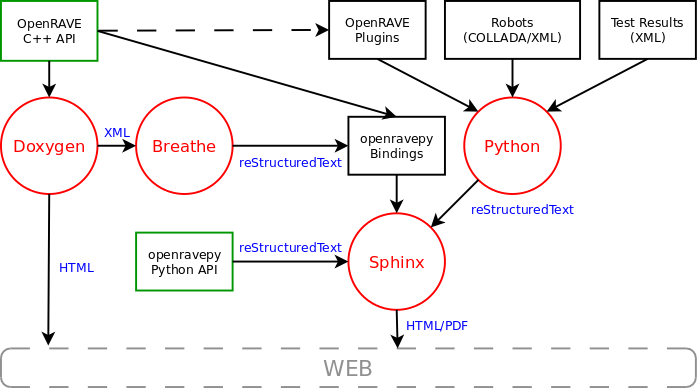 Describes the OpenRAVE documentation system and all necessary function calls for generating and maintaining the documents. This is mean for developers. doxygen version 1.7.1 or later is required. Because running build.sh can take a long time, developers should execute the individual commands pertaining to the part of the system they are maintaining. The commands are given in the following sections. # Take in the doxygen comments from the C++ API and creates python/bindings/docstrings.cpp, which is then compiled in the openravepy_int module.